Extra Extra Large (Chest 44 - 46) 1 Left! Extra Large (Chest 42 - 44) 1 Left! Large (Chest 40 - 42) 1 Left! 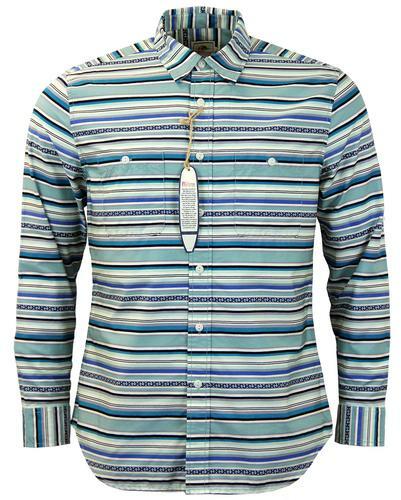 LEE SLIM FIT MENS RETRO INDIE MOD CHAMBRAY WESTERN SHIRT (Indigo). A classic Lee Jeans staple, the slim Chambray Western Shirt takes it bow at Atom Retro. Cool Indie style with regular contemporary Indie slim fit. An updated version of a classic Retro 1950s Lee style, the Lee Western Shirt was built for Cowboys, working the rugged plains of America. A symbol of Americana, a Vintage rodeo classic that is perfect for a casual Retro look. Here in a stylish distressed Vintage chambray. The Lee Western Shirt is a truly iconic style that features Mod point collar and traditional Vintage shoulder yoke - by Lee Jeans. Lee Jeans Slim Fit Retro Mens Western shirt. A cool Vintage indigo chambray with slight Indie distressed finish. Two tone effect differently coloured collar. Incorporating the iconic Western chest pocket detail and traditional tonal stitch. Authentic Lee signature woven tab detail. A traditional Lee style full of Sixties Mod charm, the Western slim chambray shirt incorporates a stylish V-shape back yoke. Retro shaped hem, button cuffs and Sixties Mod pointed fold down collar. An original Lee Jeans staple, the Slim Western chambray Shirt is finished with authentic Retro pearlised buttons. 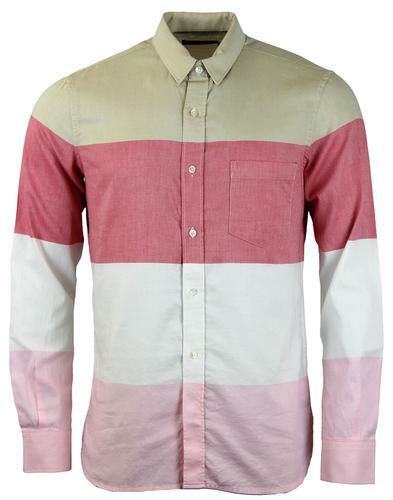 Cool, casual Indie fit Western shirt - by Lee Jeans. Established in 1889 (by Henry David Lee as the LEE Mercantile company) Lee Jeans made it's name manufacturing jackets, dungarees and shirts with it's roots in durable and hard wearing work wear clothing. As of 1913 the introduction of the iconic Union-all work jumpsuit allowed Lee to rapidly expand. The jumpsuit being the precursor to their pioneering overall introduced in 1920. The 1920's was a productive decade for Lee as they also unveiled the first ever zip fly denim jeans in this period. By the 1930's and 1940's LEE Jeans was the biggest workwear manufacturer in the US. In 1944 the iconic 'Lazy S' became the official Lee back pocket branding and has remained ever since. In the 1950s Lee Jeans moved into the lucrative casual wear market... and the rest is history - Lee Jeans since 1889. 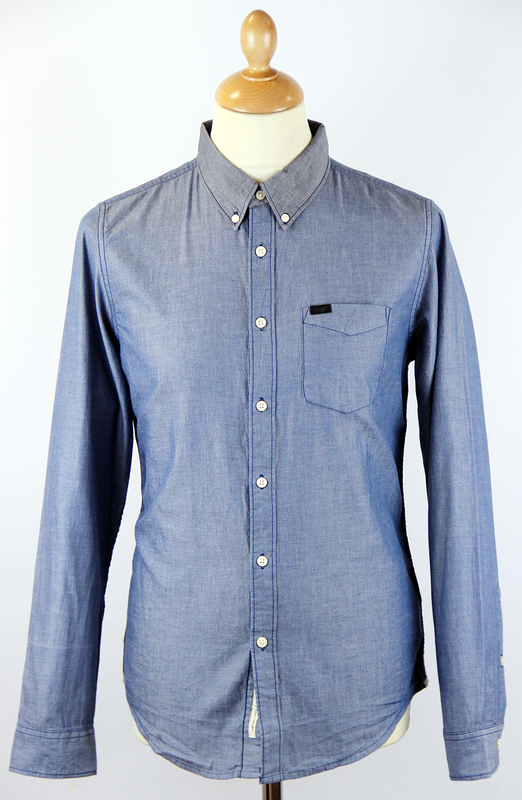 LEE MENS RETRO INDIE MOD SLIM CHAMBRAY WESTERN SHIRT. MENS RETRO INDIE MOD SLIM WESTERN CHAMBRAY SHIRT by LEE JEANS - Mens indigo Retro chambray Western Shirt with slight Indie distressed finish by Lee. Slim fit, Lee woven tab branding, chest pocket. Western style back yoke, button fasten cuff detail. 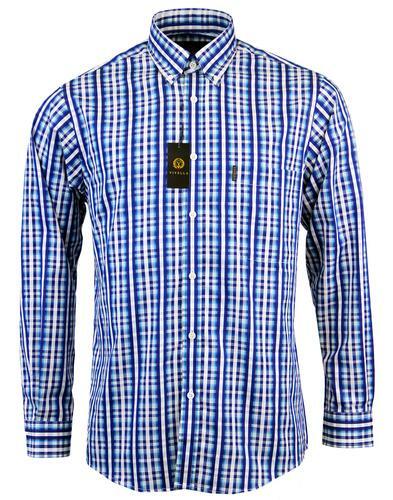 Rounded and shaped hem, Mod point collar and pearlised buttons. Tonal stitching adds further Retro appeal. Mens Slim Western chambray shirt by Lee Jeans. SKU: L880QAMC Lee Slim Chambray Western Shirt. 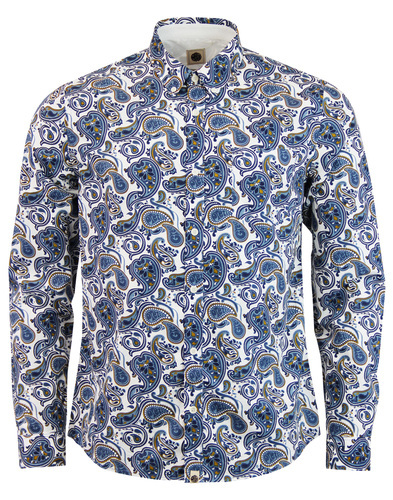 LEE Mens Retro Indie Mod Slim Chambray Western Shirt (Indigo). XXL - 44" - 46"
Lee Jeans is an original, all-American jeans brands that epitomises retro style. The original Lee Rider Jeans were worn by Hollywood legends including James Dean and Marilyn Monroe; the company is also credited with innovations such as the zip-fly and dungaree overalls. Today you can still buy authentic Lee Jeans, as well as denim jackets and Lee clothing that incorporate over 100 years of expertise in style and fit. Just look for the 'Lazy S' pocket stitching that Lee Jeans are famous for.